I am a Beaufort native, as well as a military brat. My mother’s family has lived in Beaufort for four generations, and met my father on Parris Island, where she worked in the tailor shop and he was a drill instructor. I graduated from Beaufort High School, when our mascot was still the Tidal Wave. I retired after 32 years in education, ending with supervising student teachers at USCB. I tried retirement for a couple of years, but I love people, and being busy too much to stay at home. I enjoy playing in the Strings on Bay, a string quintet, playing the organ in area churches, and writing a monthly article for Pink magazine. I have two children and two absolutely perfect granddaughters. My husband Todd is also a Beaufort native and we enjoy everything on the water; going to the Sandbar in our boat, kayaking on the Edisto River, and camping at Hunting Island State Park. I am a longtime member of the Baptist Church of Beaufort, and Vice President of the American Association of University Women. Real estate has always fascinated me, and I can never pass an Open House without stopping. Matching clients with their perfect home is a tremendous responsibility, and I look forward to sharing the beauty of the area with you. I know all about Beaufort schools, having taught in the public, private, and Department of Defense school systems. 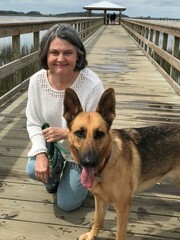 I have lived in downtown Beaufort, Mossy Oaks, Hilton Head, Seabrook, and now Lady’s Island, so I am quite familiar with the area. Welcome to Beaufort! We love it here, and know that you will too!